Thank you for your interest in the Great Books Foundation / Studs Terkel Radio Archive audio curriculum pilot program. We are so pleased that you have volunteered to take part in the pilot of our new materials, and we appreciate your help. Studs Terkel (1912–2008) was an award-winning author and a radio broadcaster whose omnivorous interests in the humanities, sciences, and social movements resulted in a remarkable audio history of the 20th century. The Studs Terkel Radio Archive audio files have strong and unique curriculum potential in part because Terkel’s conversations enact a powerful and radical form of close listening that transcends what students may be used to hearing in contemporary media. These audio files not only capture the nuances of lived experience related to historical events, but also embody what Terkel called “the feeling tone” or ineffable details, such as the sounds of people’s voices, the quality of their laughter, pauses, sighs or other non-verbal paralanguage that can convey as much about lived experience as the literal meaning of a speaker’s words. These aspects are part of what distinguishes this audio archive-based curriculum from curriculum designed around written texts, and can give students fresh and perhaps more visceral insights into the complexities of historical events and how people shape their own creative narratives about them. 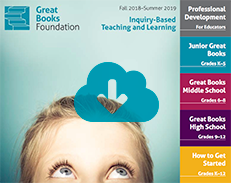 The Great Books Foundation has developed standards-aligned curriculum for a single-phase pilot program utilizing curated audio from the Studs Terkel Archives. The program is designed for students and teachers in grades 10-12, in social studies and English language arts. Great Books has curated and excerpted four Studs Terkel interviews covering different areas of interest within the broader topic of civil rights. Optional out-of-classroom writing projects, drawing on the discussion. Please review the instructions below, and then download the different materials. Please download the following items. If you are unable to access any of the items listed below, please contact Louise Galpine <louise.galpine@greatbooks.org>. Please note: These materials are in draft form. You and your students may find typos. We have not yet done our last editorial check! Complete Lessons 1 through 4 in the booklets by May 31, 2018. The number of class sessions needed to complete the activities for each lesson will vary. Check the suggested times at the beginning of each lesson. Make notes about the activities on the feedback form. Make an entry following each session. When you have completed the lessons, add to the feedback form a reflection about your overall experiences. Send the feedback form to louise.galpine@greatbooks.org. • Student work (or copies) created during the pilot. We will be in touch with information on how to mail this to the Great Books Foundation. Wait for us to contact you to schedule a brief phone interview about your experience. If you have any questions at any time, please contact Louise Galpine at 312.646.7151 or louise.galpine@greatbooks.org.